This day excursion is designed for those who wish to enjoy the highlights of the ETRUSCAN villages Tarquinia and Tuscania. After you are greeted in the port of Rome, you will proceed north east through the countryside reaching Tarquinia, located 30 min away from the port. Here you will find the greatest Etruscan museum in the world, with well-preserved sarcophagi, paintings, tombs, frescoes from the 6th to 1st centuries B.C. and the largest Etruscan necropolis. Etruscans left very little in terms of written material about their culture and society, and much of that has not yet been deciphered, so it's mostly what they've left behind after death that serves as an open book for us to learn from. The burial chambers themselves were carved into rock in to architecturally represented the interior of actual houses of that time... creating an eternal home for soul in the afterlife while celebrating the pleasures of a human life. During the decline of the Etruscan civilization, you'll notice the frescoes take on a much darker tone - both in color and theme, with infernal demons replacing cheerful celebrations. In no other Etruscan necropolis, and nowhere else in the world would you be able to see so many elaborate ancient frescoes so skilfully painted and so well preserved as these in Tarquinia. The interior of these tombs contained not only fresco masterpieces, but a treasure trove of precious objects and sarcophagi that further give us a glimpse into the life of the Etruscans and their superior craftsmanship that rivaled even the most advanced ancient civilizations. To see some of these incredible artifacts, our tour continues into Tarquinia's National inside in the elegant Palazzo Vitelleschi that features some of the most significant Etruscan archaeological findings in Italy! From here we head to our next destination: Tuscania. This part of the tour takes most of our clients by surprise because of the unspoiled countryside that you will experience at a relaxing pace. 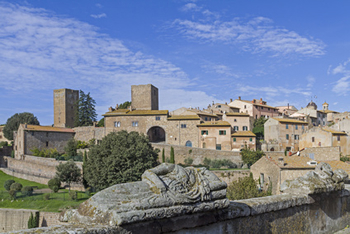 One of the oldest towns in Italy with a history dating back 3,000 years, Tuscania was another Etruscan establishment and one of the most important crossroads of inner Etruria. What we see now is a medieval town strategically situated hilltop, with a spectacular view of the valley that inspired poets. See the valley and countryside for yourself, and discover the breathtaking beauty that inspires not only poets, but each and everyone one of us. From here we will visit Tuscania's two historically and architecturally significant churches: San Pietro and Santa Maria Maggiore. It may appear strange that these two fine churches are situated so far outside the town's fortified walls, but that is where the initial settlement, called Civita (City) was established, and why these two medieval churches were built here. Tragedy struck in the 14th century when the Black Death wiped out much of the town's population, and as a result, the churches were abandoned and excluded when the city walls were rebuilt. The lack of buildings surrounding these remote churches adds to the magical feel of the site, before you make your return back to the ship in the port of Rome. Duration of this daytrip: 9 hours. You can get the tickets to sites on the spot.